According to the American Academy of Allergy Asthma & Immunology, approximately 8.3% of children in the United States had asthma in 2016. Why do we seem to be seeing an increase in the number of children affected by asthma these days? You may wonder then why wouldn’t all children living in the same house and breathing the same air, suffer from asthma equally? Your diaphragm is the main muscle used for breathing. The nerves that regulate each breath leave your brain and exit the spinal cord in the mid-neck (C3, C4 and C5) region. Spinal issues in this area can have an adverse effect on the nerve supply to the diaphragm. Reducing interference in the spine may help re-establish proper nervous system control of the lungs and boost function. Research published in the Journal of Vertebral Subluxation Research verified the results that 81 children with asthma experienced due to receiving chiropractic care. The two-month study showed that those children under care saw a 45% decrease in the number of asthma “attacks” and that 31% of the subjects voluntarily chose to reduce their medication. It’s important to note that chiropractic is not a treatment for asthma. However, many people who suffer from asthma report improvement by receiving chiropractic care. At Van Every Family Chiropractic Center, we look at exercise-induced asthma and asthma that doesn’t have a known origin. We adjust differently for those. With exercise-induced asthma we will do a lot of adjustment in motion through the chest—through the sternum and the ribcage, from the front and the back. That area helps with exercise-induced asthma because it’s directly enervating the lungs. So when you think about exercise, you move your shoulders when you’re running or doing other forms of fitness. That’s affecting the ribcage way more which then causes asthma to flare up. We’re adjusting in motion, so we’re doing a lot of movement adjustments to really help with exercise-induced asthma. With childhood asthma, we will look at it differently because that will be much more focused on the neck which is what we talk about with the chiropractic connection. We also will do a diaphragm release to help that area of breathing. There are different adjustments for that that we use on both kids and adults. At our practice, we see a massive correlation between children who have had multiple ear infections and the onset of asthma as they become a little older. The kids who are diagnosed with asthma almost always have had multiple ear infections when they’re younger and a history of throat infections. It’s almost like the nervous system drives it deeper down the body and it ends up in the lungs. 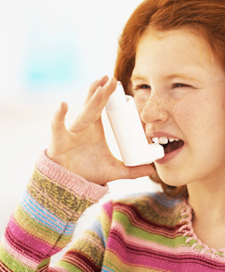 With asthma, it seems like it clears up quickly whether you’re young or you’re older because of the way we adjust it. It’s important to remember that you’re never too young or too old to get help for asthma. Contact our Royal Oak chiropractic office today to book an appointment! We have been patients of Van Every for almost five years. The decision to take our daughter to them after she suffered from respiratory issues for months, turned out to be the best decision we ever made. She avoided being diagnosed asthmatic and was immediately removed from breathing treatments after her first visit. Since that time, our entire family has become patients of Van Every. We are treated for allergies, neck/back pain, focus, stress and more. I have referred countless family and friends to Van Every and everyone is always so thankful that I sent them. Our overall health wouldn’t be what it is today if it wasn’t for the love and care of Dr. Saylor and Dr. Ashley. They are more than chiropractors to us, they are like family.